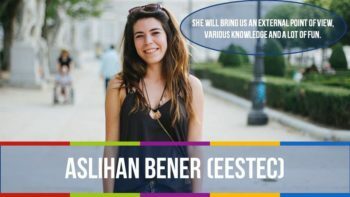 In AEGEE, everything is related to people.Therefore taking part in a human resources training is a must for everyone. 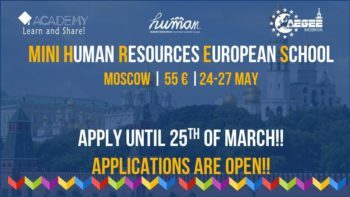 The Mini-HRES offers you the chance to take part in an amazing three-day training from 24th to 27th of May – in beautiful Moscow. You want to know more? Read this interview with organizer and former Academy Speaker Antonis Triantafyllakis. Golden Times: What can participants learn at mini-HRES Moskva 2018? • gain knowledge on the challenges and solutions in human resources management in youth organizations. You will learn what it takes to effectively attract, select, integrate, develop and maintain members. • and get an insight into the impact and significance of being a student multiplier in society and in a personal dimension. We will consult and give feedback to each other on best practices and human resources concepts used in our organisations back home. Golden Times: Who should apply? What’s the ideal participant? • can communicate in English. So, if you intend to be or already are in a position that requires putting human resources related skills in practice, this is for you! Put your motivation in your application and see you in Moscow! Golden Times: Can you give more examples where the participants they apply the knowledge? 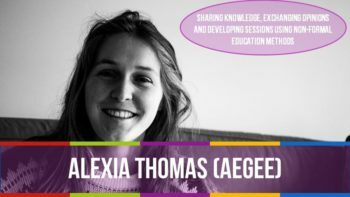 Antonis: AEGEE is one of those magical organisations that develop the “transversal skills” of young people, simply by giving them countless opportunities to put them in practice and learn from that. Pretty much every job requires working in a team and if you already have experience working in international and multi-cultural teams, such as those AEGEE so openly offers to our members, you have vastly improved your employability at an era famous for alarmingly high levels of youth unemployment, despite our extensive formal education and our means to connect in a globalised environment. Developing the skills to do so in a structured manner, such as the one offered by training courses of AEGEE-Academy, can give young people a huge advantage in their future jobs. That is especially the case in this one, that not only develops skills related to anyone required to ever work in a team, but specifically to those aspiring to work in coordinating positions in this field, such as leading teams and managing projects! Golden Times: The event is a new concept. Why did you decide to organise it? Antonis: European Schools have been around since the 1990s. 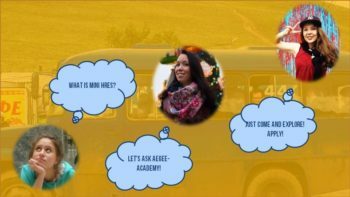 AEGEE was the first to establish its own pool of trainers, now known as AEGEE-Academy! The Mini European Schools however are indeed a new concept that AEGEE-Academy started piloting a couple of years ago, as a way to reach more people who are motivated to develop their skills, but due to their jobs and studies can’t devote a full week to attend a full European School. Mini-ES have a shorter duration, are very intensive and can therefore provide a perfect teaser for more people to experience the value of a training activity based on non-formal education methodologies, so those attending that want to further develop their skills can be even more ready and excited to attend a week-long training course in the future. Golden Times: Who are the trainers? 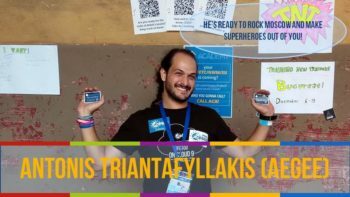 • Finally, yours truly, Antonis Triantafyllakis from AEGEE-Academy, a world explorer, who has coordinated several international teams in AEGEE and delivered more than 500 hours of training to more than 800 young people. A triple “A” team, ready to rock Moscow! Golden Times: Is the training very intensive? Antonis: With more than 20 hours of content in about three days, it most definitely is! But we are talking about non-formal education here, so the participants will develop skills based on a highly interactive structure, full of games and group work. It’s safe to say that, in this context, the higher the intensity, the greater the fun! AEGEE-Moskva will offer you great hospitality! Golden Times: The event is taking place in Moscow. Is there also time to discover the city? Antonis: Moscow is a beautiful city, so it would be unfair to not show some parts of it to our participants. Since this is an intensive training course however, most of the time will naturally be spent on developing the skills our participants will be coming motivated to advance, so the lovely organisers have brilliantly come up with the idea to have parts of the training be held in a “hidden treasure” part of Moscow! That being said, the organisers are of course ready to suggest plenty more places to visit and things to do in the city for the extra time our participants will be staying there. Golden Times: What can you tell about the social programme? Antonis: The intensity of the schedule shouldn’t hinder the social character of an AEGEE event. We’ll keep it simple for the participants to be able to pay full attention to the content, but every night there will be fun activities provided by AEGEE-Moskva for our participants to get the most out of every aspect of the event! And you can of course expect a European Night, because what would AEGEE be without AEGEE spirit? Golden Times: How much does it cost to apply – and what’s included? Antonis: The fee for the event is 55 Euros and it covers accommodation in a hostel, three meals per day, all tuition materials and local transportation during the event. It’s a bargain! Golden Times: When does the event take place, what’s the deadline and how many people can get a place? Antonis: Mini-HRES Moskva 2018 will begin on 24th of May at at 16:00 and end on 27th of May at 14:00. We have a place for 20 highly motivated participants. The application period is already on, so hurry up and apply until 25th of March to get a place in this amazing event! Golden Times: Where can interested people find out more about the event and apply? Golden Times: Anything you want to add? Antonis: This event is organised through a collaboration between AEGEE-Academy, the Human Resources Committee of AEGEE and AEGEE-Moskva, so those applying should be ready for a really high quality training event.